IslayBlog.com —> 2012 —> Vote for the FilmG 2012 entry from Islay High School! Vote for the FilmG 2012 entry from Islay High School! 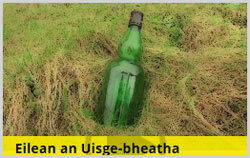 Navigate to the The Films page on the FilmG website and locate the ‘Eilean an Uisge Bheatha’ entry from Islay High School (it should look like the screenshot on the left. Click on the entry, a window should pop up where you can watch the film (if you haven't watched it yet). Towards the bottom right of the entry window you should find a ‘Vote!’ button (it should look like the screenshot on the right). To vote for Islay High's entry click it. Once you have voted the button will change to ‘You voted for this film.’, as of course you can only vote once. You've got until 31/Jan/2012 to cast your vote and tell your friends and family to vote for Islay. On the 31st of January the voting will close and the judges shortlists will be announced. Assuming Eilean an Uisge Bheatha is shortlisted and/or in the running for the People's Choice Award the group will travel to Glasgow on 09/Mar/2012 for the FilmG Awards Ceremony. Fingers crossed for Ross, Fraser, Caitlin, Mairi, Heather and Ìle!